An email cover letter is the content of an email you send with your resume. Its purpose is to explain why you're applying and introduce yourself in a very brief manner. Email cover letters are much shorter than regular cover letters you'd submit via job boards or as attachments. An email cover letter isn't your good ol’ cover letter all over again. To make it happen, you need the best email cover letter out there. An email cover letter sample that will help you land that interview. A tried-and-true email format for cover letters that showcases your most valuable strengths. How to write a cover letter in an email to get any job you want. Little known hacks for sending your cover letter email with a resume for greatest impact. First, have a look at this universal, simple email cover letter sample. What do you think makes it so special? I’ll tell you one thing, Jacob can expect the callback anytime! It’s a perfect email cover letter template you can tweak so that it fits your situation, and use to apply for any job. As you can see above, you should format your email cover letter just as any other semi-formal email. Use a standard, elegant font and double spacing between paragraphs. At the bottom, include your contact information, just as you’d do in the footer of any professional email you send. Email cover letter—body or attachment? Truth is, this choice won’t be decisive for your job hunt, so don’t obsess over it. My suggestion is—if you’re applying by email, you’re risking that your message will reach the hiring manager in a hurry, so don’t make them open TWO attachments. Write your cover letter in your email body and enclose only your resume. 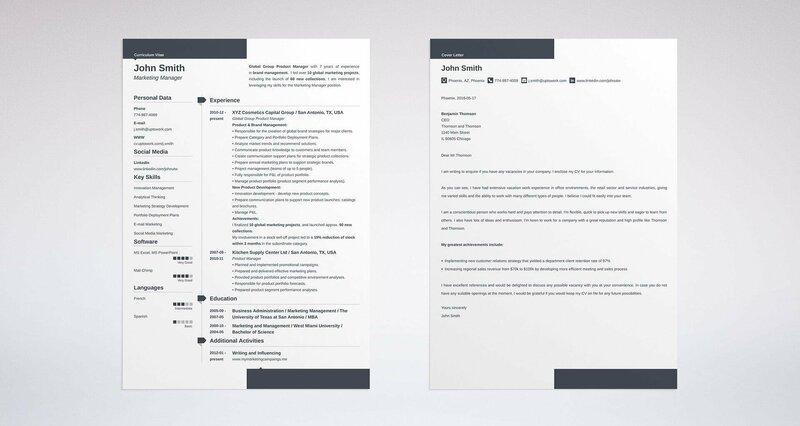 So you’ve seen a jaw-dropping job application email cover letter. 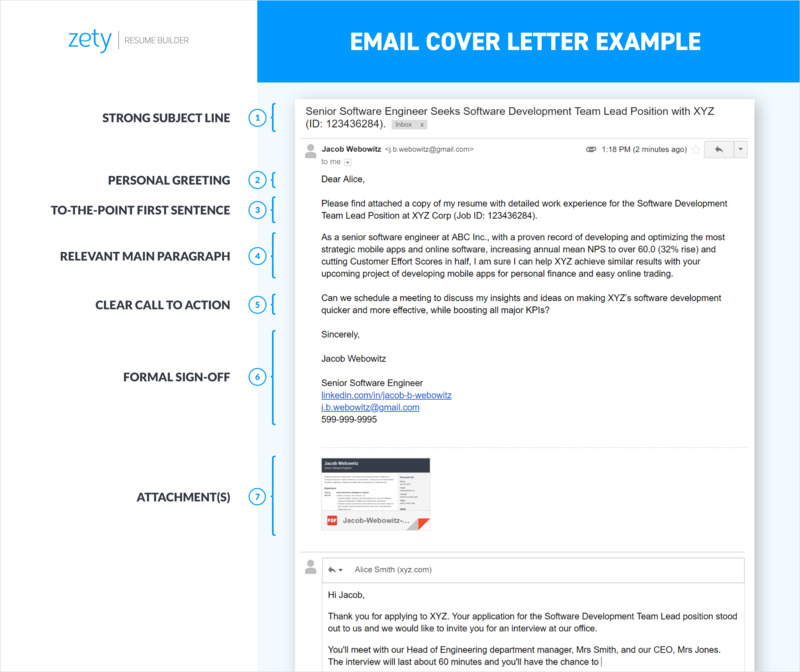 Now, let’s break down what makes this email format for cover letters so great. If no one opens your job application email cover letter. And guess what? That depends only on the subject line. Senior Software Engineer Seeks Software Development Team Lead Position with XYZ (ID: 123436284). Pro Tip: The only instance when all of the above is of no consequence? When the employer demands all applicants to use the same subject line, for example, “Application for Position XYZ - [Your Name].” If so—you have to play by their rules. How long should your cover email subject be? As long as it needs to be to include all of the above info and as short as possible. For desktop email applications it’s within the range of 46 (Yahoo Mail) to 70 (Gmail). Mobile email clients? From 30 characters (Android; portrait) to 64 characters (iPhone; landscape). To stay on the safe side, begin your subject line with the name of your position. It’s sure to stay within the narrowest, 30-character range, and the hiring manager will immediately know what vacancy the message is about. The best way to start your email cover letter is with “Dear” + the hiring manager’s name. Personalization will make the hiring manager feel like they’re reading something made specifically for them. Don’t know the name of your hiring manager? Double check the job ad. Check LinkedIn. Job offers on LinkedIn often identify the one who did the posting. Check the company website. Try to find the head of the department on the company's staff page. Ask friends. You can use LinkedIn to check if you've got contacts at the company. A Facebook shout-out may work too. Call. If all else fails, call the receptionist and ask who the contact person is. Sending your cover letter in an email instead of using job boards is an excellent strategy for escaping the resume black hole. While hiring managers book specific time slots for reviewing resumes and cover letters they got through their online recruitment systems, your email, as I said before, might reach them in a rush. For instance, heading out to a meeting or dealing with an urgent problem. In an email cover letter, don’t make the hiring manager read between the lines of some fancy storytelling. Be as straightforward as possible. Attached you will find my resume with detailed work experience for the position of [XYZ]. You’re not applying for a job. You’re applying for this job. For the hiring manager, it doesn’t matter how great your career has been so far. What matters is how you can help the company with their upcoming tasks and challenges. Read the job description carefully, identify what your responsibilities will be. Then, research the company online, try to find out what projects they’re running or plan to launch in the future. Outline your professional achievements that can translate into success in your prospective role. Highlight what you have to offer. Remember Jacob, the candidate from our sample? The company he’s applying to, XYZ Corp., is looking for a Software Development Team Lead to supervise the development of new mobile apps. As a senior software engineer at ABC Inc., with a proven record of developing and optimizing the most strategic mobile apps and online software, increasing annual mean NPS to over 60.0 (32% rise) and cutting Customer Effort Scores in half [your achievements most relevant to the job you’re trying to land], I am sure I can help XYZ achieve similar results [an offer to leverage your experience to the benefit of your future employer] with your upcoming project of developing mobile apps for personal finance and easy online trading [knowledge of your employer’s plans and your responsibilities]. Pro Tip: I can’t stress this enough—an email cover letter has to be shorter than one you would include as an attachment. How short exactly? Your go-to word count should be 150, tops. So the hiring manager knows you’re a great candidate. Job done? Ask the hiring manager to reach out to you and meet in person. Once again, focus on what you have to offer. 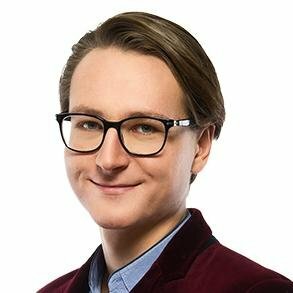 Can we schedule a meeting [asking them to reach out to you] to discuss my insights and ideas on making XYZ’s software development quicker and more effective, while boosting all major KPIs [restating your offer]? Pro Tip: The two worst things you can do in your email cover letter closing are coming off as needy (I’m sure I’d make a great employee, just give me a shot!) or generic (Thank you for your time and consideration). Once you’ve written your email cover letter for a resume, you just need to put a formal greeting at the very end. Write “sincerely” and follow it with your full name. Pro Tip: Under your sign-off, put the necessary contact information, such as your LinkedIn profile, email address, and telephone number. To save yourself the effort of adding them every time you send an email covering letter, you can include them automatically in the footer of your email. You can also include a digital copy of your handwritten signature. It will add a nice, professional touch. So you’ve just written your perfect, short email cover letter. Now you’re basically guaranteed to land that interview, right? Your email arrived with a cover letter in the main body. I was really impressed and could not wait to review your resume. There was only one problem. You’d forgotten to attach it. I replied to your email asking you to reattach your resume and you did not respond until the following day. In any case, it was already too late. I don’t think you really wanted that job. And I don’t think I need to explain further, do I? Pro Tip: If you have forgotten to attach a resume to your email cover letter, don’t resend the whole message, just shoot a quick follow-up email with your resume attached. Would rather avoid this nightmare scenario? Attach all the necessary documents before you start writing a cover letter email. “[Your first and last names]-resume-[the company name],” for example: John-Smith-resume-Intel NOT My-resume-124. Use a clear, strong subject line. Open with a proper greeting—address the hiring manager by their name. In the first sentence, explain why you’re writing and what position you’re targeting. Write a brief main paragraph that outlines your most relevant experience and achievements. Close with a call to action—ask to schedule a meeting and reiterate your offer. Sign-off with a “sincerely” synonym and your full name. Put your contact details in the footer. Don’t forget to attach a resume to your cover letter email! Got any additional questions about writing and sending a cover letter email? Want to share your experience with applying by a direct email message? Give me a shout in the comments. I can’t wait to hear out your thoughts. Let’s chat!